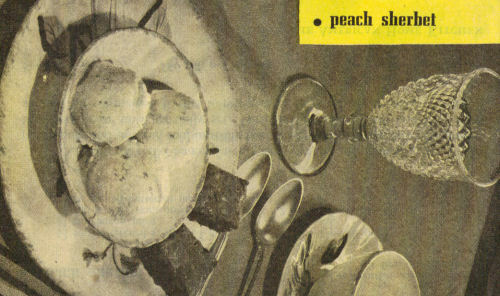 This recipe was clipped from the American Home magazine that was published from 1928 to 1977, date of this clipping is unknown. Recipe is typed below along with a scanned copy of both sides. 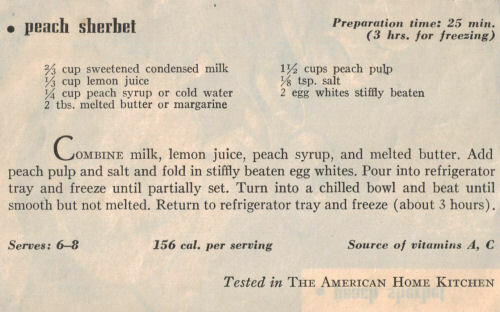 COMBINE milk, lemon juice, peach syrup, and melted butter. Add peach pulp and salt and fold in stiffly beaten egg whites. Pour into refrigerator tray and freeze until partially set. Turn into a chilled bowl and beat until smooth but not melted. Return to refrigerator tray and freeze (about 3 hours).